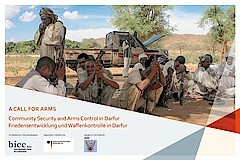 On the occasion of the Open Day of the German Federal Foreign Office in Berlin, BICC will be showing the photo exhibition “A CALL FOR ARMS – Community Security and Arms Control in Darfur” in the “Blue Hall” (Blaue Halle) at the Foreign Office on 29 and 30 August 2015. People's yearning for life in peace is great. The marking and registration of small arms and light weapons is a first step towards the control of weapons that bring suffering and destruction. Such topics lie at the very heart of the work of the peace and conflict research institute BICC. On behalf of the German Federal Foreign Office, BICC offers technical advice and support to local and national small arms control efforts, particularly in West Darfur. In its work, BICC supports co-operation between weapons registering committees, traditional community leaders, and the area offices of the Sudan Disarmament, Demobilisation and Reintegration Commission (SDDRC). It is due to such co-operation that more and more community members are willing to have their weapons registered and marked. BICC will also show the video documentary “A Call for Arms-Community Security and Arms control in Darfur” during the Open Day of the Foreign Office (Werderscher Markt 1, 10117 Berlin). Nikhil Acharya will demonstrate a dot-peen marking machine that marks the weapons as part of the registration process of small arms in Darfur. Nikhil Acharya (BICC) and the mascot of the Open Day the "Maus"